1. Heat 2tbsps of oil in a large saucepan. Fry the onion and garlic for a few minutes. Add the chilli powder, paprika and cumin and cook for a further minute. 2. Add the beef mince and brown. Add the mushrooms, tomatoes and beef stock. Season with salt and pepper. Simmer for 15-20 minutes until the sauce has thickened. Rinse the kidney beans thoroughly and add to the saucepan before simmering for another 10 minutes. 3. Preheat the oven to 180°C. 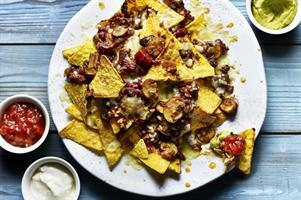 Add a layer of half the nacho chips to an ovenproof dish, add half the beef and mushroom chilli and spread evenly before sprinkling half the cheese over the top. Add the remaining chips and repeat layering. 4. Bake the nachos in the oven for 10-12 minutes until the cheese has melted and is starting to bubble. When ready, remove from oven and serve immediately with salsa, guacamole and sour cream.